In the lead-up to Refugee Week 2017, MOAS celebrates this year’s theme ‘Different pasts, shared future’ by sharing the first-hand stories of people who have experienced forced migration. Today, we are proud to share Nadine’s story with you. 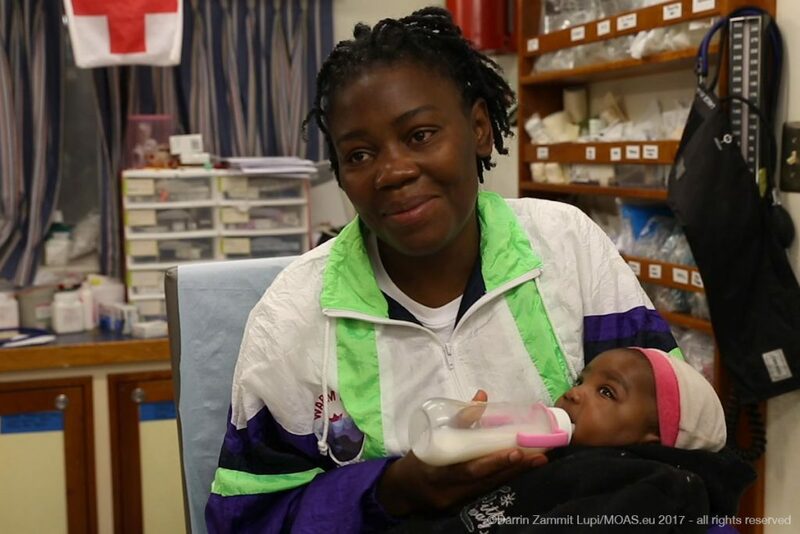 She is a 22-year old woman from Cameroon travelling with her daughter Hope, rescued by the MOAS crew from the Central Mediterranean in May 2017. This is their story. “After my father’s death, my older sister decided to travel, to change countries. She didn’t want to stay in Cameroon anymore, because my father’s death really affected her, so she decided to travel. At the time, we were living in Yaoundé in a room. She got a passport, as we have an uncle in the Netherlands, she told him that she wanted to leave the country. My uncle didn’t give us the necessary documents to travel, so she just left with me. She’s the one who raised me, not my mother. She told me we had to go on an adventure, and we hit the road – even my mother didn’t know. First, we went through Nigeria – at that time, there was Boko Haram, but we went through, and nothing bad happened to us. When we got to Niger, we didn’t have any money left, so we stayed there. In Niger she met a man, so she settled down there. There, I met a man who told me he wanted to marry me… it was the first thing he said to me. I’ve always lived with my big sister, I didn’t know this man – I didn’t get with men. If someone was interested in me, I would go tell my sister and she would give me advice. But at that time my sister wasn’t there, so this man came to me, said he wanted to marry me, that we should be together, that he wanted to be with me. When I got pregnant… the simple fact that we had been together… I didn’t agree with it. I didn’t want to do it before marriage, but he kept pressuring me, saying he wanted to marry me, that I needed to trust him. So I gave in. By giving in, I got pregnant. After spending a year in Niger with her sister, Nadine undertook the perilous journey through to Libya, as thousands of people do every year. Libya was her last stop before being put on an unseaworthy dinghy with her daughter and many others to attempt the perilous crossing. I wanted to go back home, but I couldn’t go back. This one time I called my sister, telling her I wanted to go back – ‘Please send me the money so I can get out of this place and go back’. She said ‘If you try to come back they will kidnap you. It’s impossible to go back, you’re in Libya now.’ With all that suffering, all I wanted was a place to escape to, to leave Libya… I needed to leave Libya no matter what. I didn’t want to stay in detention for my whole life with my child – who was going to help me? To get from detention to the boat, the Libyans helped me, when they saw my suffering. They helped me and my daughter to get on the boat: I didn’t have to pay anything. 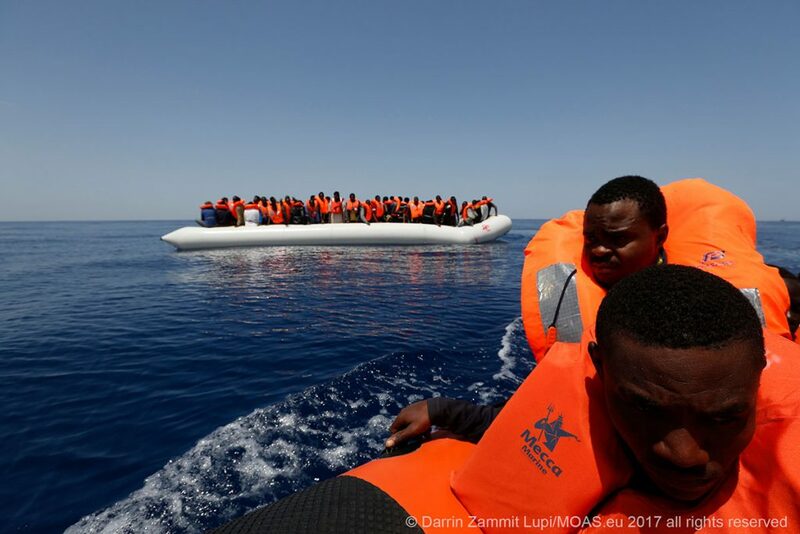 Please sign up to our newsletter at the bottom of this page for all the MOAS news and updates and support our rescue missions by giving whatever you can to help us save lives at sea. This project has been funded with support from the European Commission. This publication reflects the views only of the author, and the Commission cannot be held responsible for any use which may be made of the information contained.